Android Studio supports a variety of XML attributes in the tools namespace that enable design-time features (such as which layout to show in a fragment) or compile-time behaviors (such as which shrinking mode to apply to your XML resources). When you build your app, the build tools remove these attributes so there is no effect on your APK size or runtime behavior. The following attributes help suppress lint warning messages. This attribute accepts a comma-separated list of lint issue ID's that you'd like the tools to ignore on this element or any of its decendents. This attribute works the same as the @TargetApi annotation in Java code: it lets you specify the API level (either as an integer or as a code name) that supports this element. This tells the tools that you believe this element (and any children) will be used only on the specified API level or higher. This stops lint from warning you if that element or its attributes are not available on the API level you specify as your minSdkVersion. However, you should instead use GridLayout from the support library. This tells the tools what the default language/locale is for the resources in the given <resources> element (because the tools otherwise assume English) in order to avoid warnings from the spell checker. The value must be a valid locale qualifier. 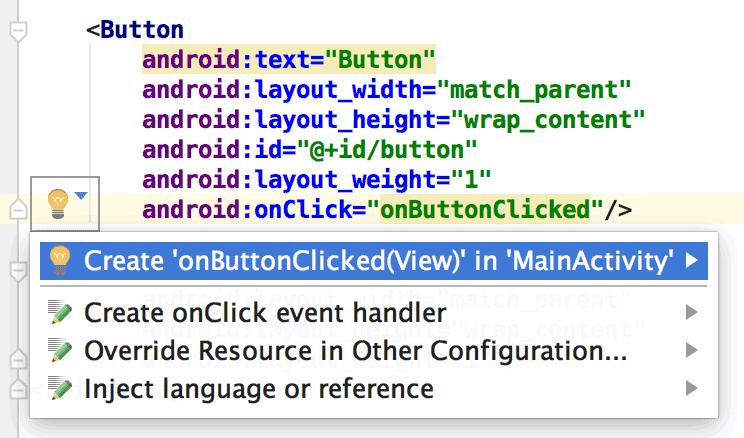 The following attributes define layout characteristics that are visible only in the Android Studio layout preview. You can insert sample data in your layout preview by using the tools: prefix instead of android: with any <View> attribute from the Android framework. This is useful when the attribute's value isn't populated until runtime but you want to see the effect beforehand, in the layout preview. For example, if the android:text attribute value is set at runtime or you want to see the layout with a value different than the default, you can add tools:text to specify some text for the layout preview only. You can add both the android: namespace attribute (which is used at runtime) and the matching tools: attribute (which overrides the runtime attribute in the layout preview only). When using the Layout Editor in design view, the Properties window also allows you to edit some design-time view attributes. Each design-time attribute is indicated with a wrench icon next to the attribute name to distinguish it from the real attribute of the same name. This attribute declares which activity this layout is associated with by default. This enables features in the editor or layout preview that require knowledge of the activity, such as what the layout theme should be in the preview and where to insert onClick handlers when you make those from a quickfix (figure 2). Tip: You can also select the theme for the layout preview from the Layout Editor toolbar. For a given RecyclerView, this attribute specifies the number of items the layout editor should render in the Preview window. This attribute declares which layout you want the layout preview to draw inside the fragment (because the layout preview cannot execute the activity code that normally applies the layout). These attributes specify which layout to show in the layout preview for a list's items, header, and footer. Any data fields in the layout are filled with numeric contents such as "Item 1" so that the list items are not repetitive. Note: These attributes don't work for ListView in Android Studio 2.2, but this is fixed in 2.3 (issue 215172). This attribute allows you to point to a layout that uses this layout as an include, so you can preview (and edit) this file as it appears while embedded in its parent layout. Now the layout preview shows this TextView layout as it appears inside the activity_main layout. These attributes set minimum and maximum values for a NumberPicker view. end 800005 Push object to the end of its container, not changing its size. left 3 Push object to the left of its container, not changing its size. right 5 Push object to the right of its container, not changing its size. start 800003 Push object to the beginning of its container, not changing its size. Intended for: Any view that supports UI text or images. The following table describes the types of placeholder data you can inject into your layouts. @tools:sample/full_names Full names that are randomly generated from the combination of @tools:sample/first_names and @tools:sample/last_names. @tools:sample/cities Names of cities from across the world. @tools:sample/us_zipcodes Randomly generated US zipcodes. @tools:sample/us_phones Randomly generated phone numbers with the following format: (800) 555-xxxx. @tools:sample/lorem Placeholder text that is derived from Latin. @tools:sample/date/day_of_week Randomized dates and times for the specified format. @tools:sample/avatars Vector drawables that you can use as profile avatars. @tools:sample/backgrounds/scenic Images that you can use as backgrounds. The following attributes allow you to enable strict reference checks and declare whether to keep or discard certain resources when using resource shrinking. This attribute allows you to specify whether the build tools should use "safe mode" (play it safe and keep all resources that are explicitly cited and that might be referenced dynamically with a call to Resources.getIdentifier()) or "strict mode" (keep only the resources that are explicitly cited in code or in other resources). When you enable strict mode, you may need to use tools:keep to keep resources that were removed but that you actually want, and use tools:discard to explicitly remove even more resources. For more information, see Shrink your resources. When using resource shrinking to remove unused resources, this attribute allows you to specify resources to keep (typically because they are referenced in an indirect way at runtime, such as by passing a dynamically generated resource name to Resources.getIdentifier()). When using resource shrinking to strip out unused resources, this attribute allows you to specify resources you want to manually discard (typically because the resource is referenced but in a way that does not affect your app, or because the Gradle plugin has incorrectly deduced that the resource is referenced).